Dubai, UAE, October 26, 2016: Najahi and Success Resources, the leading seminar organizer in the world, have announced that the National Achievers Congress 2016 will be held under the patronage of H.E. Sheikh Nahyan bin Mubarak Al Nahyan, the Minister of Culture and Knowledge Development, who will be delivering the opening speech. Held in the Middle East for the first time on 18th and 19th of November 2016 at Festival Arena Al Badia in Dubai, UAE, the renowned international congress brings together a line-up of outstanding global achievers and influencers to deliver an impactful and cutting edge conference agenda. The congress is designed to inspire entrepreneurs and encourage them to follow their dreams, create business and investment vehicles to support them and find fulfilment and happiness while doing so. “It is a great honour and privilege to have the region’s first National Achievers Congress under the patronage of H.E. Sheikh Nahyan bin Mubarak Al Nahyan. As an eminent knowledge and cultural leader in the UAE, his support of the congress exemplifies the entrepreneurial spirit of the country and the Middle East as a whole. Our voyage towards giving knowledge thirsty youth and entrepreneurs the essential elements to flourish in doing what they love has been made easier with all the support we’ve been receiving.” said Zina Al-Zuhairi, Co-founder and Executive Director of Najahi. “The event programme has been carefully crafted to reflect the current trends in personal empowerment, financial education and leadership skills. All these will be delivered to you by the inspirational teachings of these highly successful achievers who don’t just teach, but also put their teachings into practice.” Added Al-Zuhairi. Keynote topics at the inaugural two-day event include ‘Why The Rich Gets Richer: Crash of 2016, financial education, savers and losers’ by investment icon and author of best-selling book “Rich Dad, Poor Dad”, Robert Kiyosaki. During this session, the audience will learn how to start investing in their financial education and building for their future through the power of wealth creation and management. Andrew Matthews, the best-selling author-illustrator of books such as Happiness Now, How Life Works, and Follow Your Heart, will deliver an inspiring talk on ‘The Art of Happiness’ where he will explore the true meaning of being happy, despite the situation that you may be in, and how to make a 180 degree turn the tide around to your favour. Other exceptional achievers featured at the congress include cultural consultant and prominent Emirati business mentor Ali Al Saloom, who will treat the audience to an exciting session titled ‘Be a pioneer or disappear’, and an inspirational session by Internet-mogul Peng Joon, who will share his insights into Internet Marketing and how to use the internet to generate a massive income. Michelle Mone, OBE, the multi-award winning Entrepreneur-turned-Parliamentarian and advocate for female equality in business in the UK, will share her secrets about ‘Creative Entrepreneurship’ with valuable lessons on how to be resourceful and optimise existing resources to get better results as a person, an employer or even an employee. Over the course of the two days, the audience will also hear from Sandy Jadeja, JT Foxx and Kevin Green among others. 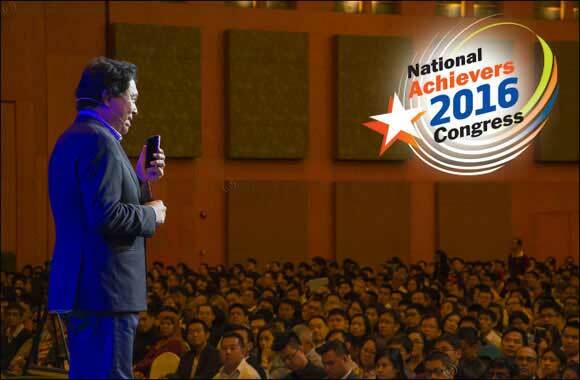 Throughout its rich history, the National Achievers Congress has had on its platform iconic speakers such as Sir Richard Branson, Lord Alan Sugar, Tony Robbins, Bill Clinton, and Tony Blair. To register your interest or booking, or for more information on the National Achievers Congress, please visit: http://www.nationalachieverscongress.ae or call Najahi Event Organizers on +971(02)2035800.